We’ve heard of Chinese automaker GAC Motor before. This is the same company that rolled up to the Detroit Auto Show in 2013 with its flagship brand Trumpchi that included features like “Tweeter” and “Sackbut” in its cars. We haven’t forgotten. 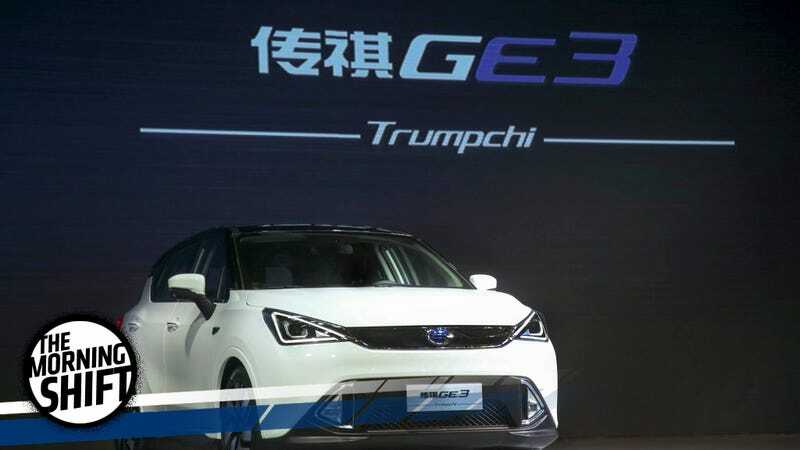 “This is a complete coincidence, we didn’t even have the slightest idea he would be president,” Feng Xingya, GAC Group President, said at the Shanghai auto show. I feel bad for these guys. They were just trying to choose a powerful and auspicious name. But language is a tricky thing and sometimes things get lost in translation. Remember how we all joked that Elon Musk is the real life Tony Stark? Well... don’t laugh, but his newest company Neuralink Corp is working on hooking human brains up to computers. Specifically, people with brain injuries “due to stroke, cancer lesion, etc.” And soon. Like, four years soon, reports Reuters. Artificial intelligence and machine learning will create computers so sophisticated and godlike that humans will need to implant “neural laces” in their brains to keep up, Musk said in a tech conference last year. “There are a bunch of concepts in your head that then your brain has to try to compress into this incredibly low data rate called speech or typing,” Musk said in the latest interview. The technology could take about eight to 10 years to become usable by people with no disability, which would depend heavily on regulatory approval timing and how well the devices work on people with disabilities, Musk was quoted as saying. In March, the Wall Street Journal reported that Musk had launched a company through which computers could merge with human brains. Neuralink was registered in California as a “medical research” company last July, and he plans on funding the company mostly by himself. Space Daddy Starboy Elon is coming for our brains, kids. The story also notes that the dealers wished to remain anonymous because they feared FCA’s wrath. In other news, FCA CEO Sergio Marchionne has said earlier this month that the first quarter has been “difficult” for the company. I’m not insinuating anything. These are just the facts. If there was one thing our National Parks were missing, it was EV charging stations. That could be changing, and fast! Wards Auto reports that the first of up to 100 EV charging stations in national parks and the communities surrounding them were switched on this week. Fittingly, it was at Thomas Edison National Historical Park in West Orange, New Jersey. The stations are the result of efforts by the National Park Foundation, National Park Service Department of Energy and BMW of North America to make EVs a practical option for travel to national parks. The stations also will help reduce air pollution in the parks and gateway communities near park entrances. Members of the public-private partnership are identifying park locations for additional charging stations. They will consider factors such as proximity and strength of EV markets, distance from nearby charging locations, and natural and cultural landscape features. Dozens of the country’s 417 national parks already have expressed interest and are studying site options. The Department of Energy’s Clean Cities Program will work with the national parks and BMW to provide technical assistance to the project. I think this is just a lovely idea. There are a few subscription car services you can choose from (although in pretty limited locations at the moment.) One of them is through Cadillac. Another is through Hyundai and the 2017 Ioniq Electric. The word “unlimited” was used liberally in the press release. Basically, customers can choose one fixed monthly payment for a 36-month term from between $275 to $365. The monthly payment includes unlimited mileage, electric charging reimbursement, scheduled maintenance and vehicle wear items. While the Hyundai Ioniq was first supposed to be nationally available, it was reduced to ZEV states. After deliveries were pushed, it now seems that availability has been reduced to California – at least for now. It might be too soon to call, but the vehicle is shaping up to be a compliance car. Maybe a good one, but a compliance car nonetheless. Neutral: If you could name a car brand, what would you name it?